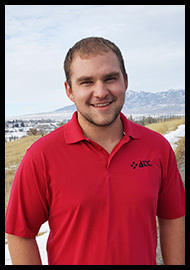 Kaydon Beard has been with ATC since 2016, where he began his employment as a seasonal employee working summers in the Arco area. In the fall of 2017, Kaydon transitioned to full-time status and by 2018, he relocated to the Malad area. Kaydon was born and raised in the Lost River Valley, and has a family tree with deep roots in the area. Although he may seem a bit shy at first glance, Kaydon quickly wins over everyone he meets with his easy-going smile, and here-to-please attitude. Kaydon loves Mountain Dew, home-cooked meals with Dutch oven potatoes, and boating with family and friends. Our “Fair-Haired Fella” is fast becoming a company-wide favorite with his willingness to take on new duties, and his ability to consistently do more than what is expected. We’re grateful to have this witty, charismatic, hard-working fella on our ATC team.